The world's rarest goose due to the curiosity and gentle nature that made it all too easy to kill, the Hawaiian Goose lacks plumes and thus was not highly regarded by the Polynesians who sought the feathers for their chieftains' cloaks. Villagers and explorers, however, hunted them unmercifully for food. This species, also called Nene, dwindled until by the 1940's probably fewer than a dozen wild Nene remained. But state authorities joined forces with a local rancher to breed a successful and substantial flock, thus preserving the species. 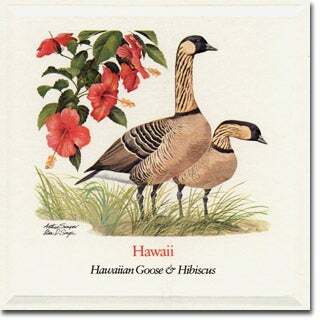 The Hawaiian Goose dwells only on the islands of Hawaii and Maui. The Hibiscus is Hawaii's most outstanding flower. 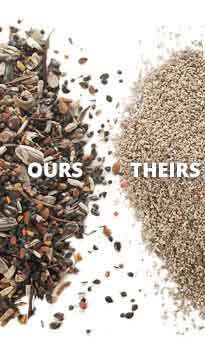 More than thirty-three varieties have been brought from other countries, and by crossing these with one another and with three native species, more than five thousand horticultural varieties have now been produced. Contrary to popular belief, the flowers do not need to be placed in water to last. In fact, Hibiscus buds are often picked in the early morning, put in an ice box, and brought out to open in the evening for a special occasion. 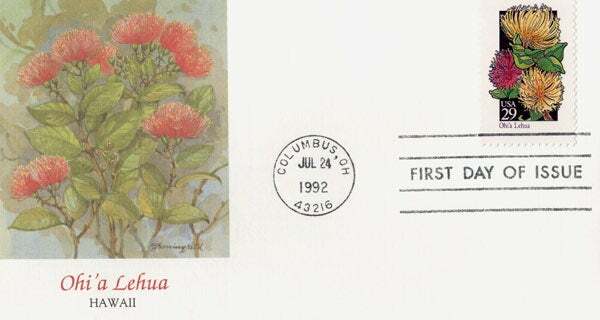 Hawaii Wildflower - Ohi'a Lehua Art from the 50-stamp series, State Birds and Flowers, issued April 14, 1982 simultaneously in all state capitals.